Ancient Skeleton Reveals Signs of Leprosy in India in 2000 B.C. Testicular cancer is the most common cancer among young men between the ages of 15 and 40 and its incidence in non-Hispanic Caucasian men has doubled in the last 40 years. Researchers have now identified two common gene variants that are associated with increased susceptibility to this disease. This discovery lays the groundwork for genetic tests for susceptibility to testicular cancer which is over 90% curable if detected early. In a genome-wide association study, Dr. Katherine Nathanson, senior author of the report, and collaborators, found that men who have two copies of the common version of the c-KIT ligand (KITLG) gene have a 4.5-fold higher risk of testicular cancer than men who have two copies of the less common or minor version of the gene. Additionally, men with two copies of the common version of variants next to another gene, sprouty 4 (SPRY4), have a 1.48-fold higher risk than men with two copies of the less common version of this gene. "This finding is quite different than those observed in many other genome-wide association studies," Dr. Nathanson said. "In most studies, the increased risk of disease is associated with the less common variant of the gene. In this case, it is the more common variant in Caucasians that is associated with risk. If you carry two copies of the less common variant you are probably at incredibly low risk.” “Our observed strong association is intriguing and may reflect the impact of the genetic effect of KITLG," lead author Dr. Peter Kanetsky noted. "However, since the prevalence of the common variant is so high, it may also reflect other underlying factors required in conjunction with KITLG for disease development. This remains to be determined.” Additionally, the new findings may begin to explain why white men are more often diagnosed with testicular cancer than African American men. Mice engineered to carry the humanized version of the FOXP2 gene show changes in brain circuits that have previously been linked to human speech, and the engineered mouse pups show qualitative differences in the ultrasonic vocalizations they use when placed outside the comfort of their mothers' nests. The FOXP2 gene has previously been putatively associated with development of speech in humans. One important difference between humans and chimpanzees are two amino acid substitutions in FOXP2. Those changes became fixed after the human lineage split from chimpanzees and earlier studies have yielded evidence that the gene underwent positive selection. That evolutionary change is thought to reflect selection for some important aspects of speech and language. "Currently, one can only speculate about the role these effects may have played during human evolution," the researchers wrote. "However, since patients that carry one nonfunctional FOXP2 allele show impairments in the timing and sequencing of orofacial movements, one possibility is that the amino acid substitutions in FOXP2 contributed to an increased fine-tuning of motor control necessary for articulation, i.e., the unique human capacity to learn and coordinate the muscle movements in lungs, larynx, tongue, and lips that are necessary for speech. We are confident that concerted studies of mice, humans, and other primates will eventually clarify if this is the case." 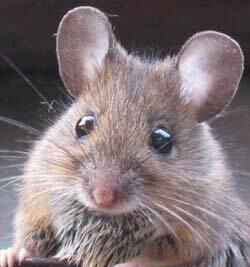 The authors cautioned that not enough is known about mouse communication to yet read too much into what the current results might mean. The senior author of the report was Dr. Svante Paabo. The work was published in the May 29 issue of Cell.